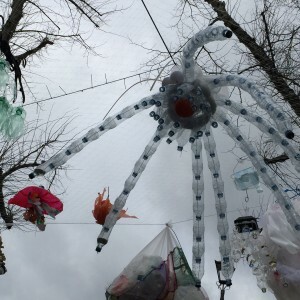 As part of the Telegraph Hill Festival this year local artist Angel McMahon was asked to lead a project with local schools and community groups highlighting the issue of plastic in our oceans. Participants were asked to imagine what strange mutant sea creatures might evolve if we continue to pollute the seas. The creatures were made entirely from recycled plastic waste and were suspended from the trees in the front courtyard of St Catherine’s Church. They were illuminated at night by led lights which made them look very ghostly.